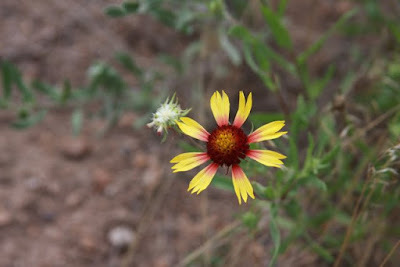 The Hampton Inn we stayed is actually located in White Rock, NM, which is a part of Los Alamos, NM. I lived here for 6 years and attended elementary there. This is a great place to live and enjoy the outdoors. One of things I find attractive now about this is area is what I call the lack of consumerism. 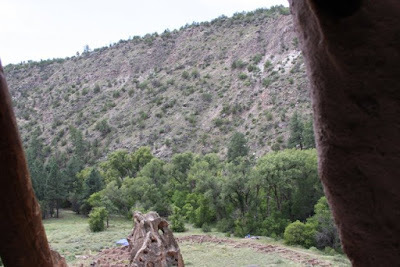 We headed out to Bandelier National Monument after a quick breakfast. The trail we decided to take was the Main Loop. 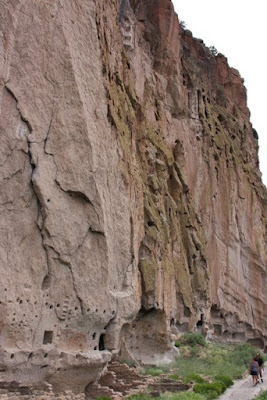 This is a very easy hike mostly on a 1.2 mile paved trail that goes through archaelogical sites. After yesterday's hike in Sedona the girls needed something easy. 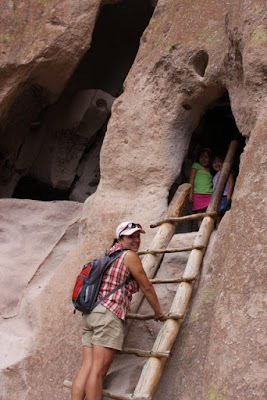 We also climbed up ladders into a few cavates. 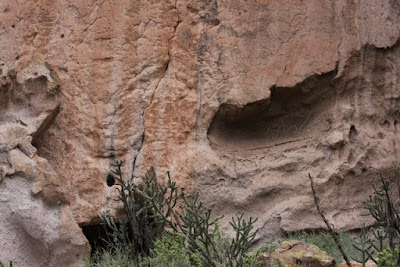 A cavate is small alcove carved out by Indians. After the brief hike we headed into Los Alamos and grabbed a quick Subway lunch. From there we visited the Otowi Station. I love this small bookstore. It has a nice mix a books, including many related to the atomic history of Los Alamos, and science toys that the girls always enjoy looking at (and asking for). This bookstore is right next to the extremely interesting Bradbury Science Museum. This is a free attraction, too. From there we made the 30 minute trip into Santa Fe to shop at the plaza. Then, it was onto Maria's New Mexican Kitchen. This place has the best margarita anywhere. The owner actually has published The Great Margarita Book. They have over 150 different tequilas available. The margaritas vary in price from $6.50 for the 100% agave house up to the $45.00 top of the line. Of course, Dianna and I stuck with the $6.50 version. We also both had the blue corn enchilada stack. This was a traditional New Mexican style enchilada plate with the blue corn tortillas stacked instead of rolled, and we both opted to have an over-easy egg on top (this is a New Mexican thing). I had the stack Christmas style which meant that enchiladas had red and green chile sauce. I have had these before without the egg and I think I like it better without. The rice beans and beans were very average. We were in margarita mode after taking down 4 strong margaritas between us so, we stopped at the Walgreens Drug Store on the way back to White Rock. It seems like every store in New Mexicon sells hard liquor and Walgreens was no different. What a concept...you can get juice for your meds at the same stop. They had the Jose Cuervo premixed margaritas on sale super cheap so we got some to have for our home bar. When we got back into White Rock we went to the Overlook. Even though it was dusk we still had a great view of the canyon with the Rio Grande at the bottom. I find this place to be incredibly relaxing. Growing up in White Rock I would ride my bike with friends to this spot just to hang out. I miss this part of the world. We went back to the Hampton to rest for the long drive back home the next day.